I must admit at first glance I was impressed with the quality of this Bible. It follows the same handy size format as the previous edition, has a soft pliable cover, nice embossing, slick Bible aids including charts, maps etc. overall a clean, sharp and impressive Bible! However looks can be deceiving! The killer question is does this Bible accurately reflect the earliest extant manuscripts? Is it truly “the best translation” as the Watchtower would have us believe? In this essay I will focus primarily on the New World Translation (NWT) committees claim that the name Jehovah should be inserted into the Greek New Testament text (referred to by the Watchtower as the Christian Greek scriptures). In the process of discussion I will touch on source material, scholarship, and translation. We might begin by inquiring as to what Greek master “copies” lie behind the revised NWT Christian Greek scriptures? Under the heading “Establishing the Hebrew and Greek Text for Translation” (Appendix 3) the NWT committee admits to using as master copies the 19th century Westcot and Hort text as well as the Nestle and Aland United Bible Societies master text (Novum Testamentum Graece). The Nestle-Aland text is the primary source for most contemporary New Testament translations, and is the standard for academic work in New Testament studies. Please note that Novum Testamentum Graece does not insert the name Jehovah or any other derivation of the divine name into the text. This primary critical apparatus is part of the source material for the NWT Revised 2013 edition. Now I’m not sure if Jehovah’s witnesses really ponder this strange arrangement but the Watchtower is essentially drawing on the scholarship of Christendom to produce it’s Bible! Admittedly not all of NT academics are Christians but many are and the vast majority would confirm key text such as John 1:1 as refering to Jesus as deity. How ironic that the Watchtower would employ textual criticism, lexicons, and commentaries from their arch nemesis “Christendom”. Such revelation should come as a great shock to JW’s who think the society has the best scholars on earth and are in no need of outside help! We might also inquire who exactly were the translators? As is usual in Watchtower literature these men remain anonymous. I submit to you anonymity has not been adopted for the sake of humility but rather anonymity essentially absolves the committee of personal responsibility and critique. In other words the NWT committee hides inside an ivory tower expecting all Jehovah’s witnesses to mindlessly accept this revision as the most accurate Bible yet produced. How terribly sad that the foot soldiers of the Watchtower cannot in good conscience question or critique this new edition. Well I am here to help! Consequently what we end up with is a committee of theologically bias Jehovah’s witnesses pretending to be scholars engaging in the process of translation using master texts from Christendom! Surely that is a recipe for disaster! Sanctify God’s name by restoring it to its rightful place in the Scriptures.—Matthew 6:9. Accurately convey the original message that was inspired by God.—2 Timothy 3:16. Translate expressions literally when the wording and structure of the target language allow for such renderings of the original-language text. Communicate the correct sense of a word or a phrase when a literal rendering would distort or obscure the meaning. Use natural, easy-to-understand language that encourages reading.—Nehemiah 8:8, 12. Please notice that points 2-4 engage the theory and practice of Bible translation, however these normative points are superseded by a uniquely “Watchtower” bias viz. point 1; “the restoration of Gods name” i.e. Jehovah. Why the obsession with a name, especially when the correct translation/pronunciation of the Tetragrammaton (YHWH) is highly subjective? Suffice to say the translation “Jehovah” is an acceptable translation wherein YHWH or an equivalent (κγριος LXX) occurs in the oldest copies of the Hebrew (Masoretic) Scriptures. However the same cannot be said of the Christian Greek NT. In their obsession over the Tetragrammaton the NWT committee actually flaunts its own rules to be “faithful to the original text” and arbitrarily and inconsistently inserts the name “Jehovah” into the New Testament (Greek scriptures). Now we must be absolutely clear, there exists no extant NT Greek manuscript anywhere in the world that contains the Tetragrammaton. And yet the NWT committee claims to be loyally restoring the divine name to the NT (Greek scriptures). How can they be?Interestingly despite the absence of manuscript evidence the NWT committee claims it has compelling evidence to insert the name Jehovah. Let us examine some of these so-called evidences. Evidence 1 – Copies of the Hebrew Scriptures used in the days of Jesus and his apostles contained the Tetragrammaton throughout the text. Yes this may well be true, but just because the Hebrew Scriptures contained the Tetragrammaton and Jesus and the Apostles recognized the name does not warrant insertion of that name into translations of the Greek NT text that omit the name. Evidence 2 – In the days of Jesus and his apostles, the Tetragrammaton also appeared in Greek translations of the Hebrew Scriptures (LXX). Yes again this is true. Some LXX manuscripts did copy the divine name over from the Hebrew to the Greek. However we must be clear here that the LXX copies are Greek translations of the Old Testament Hebrew and have no bearing on whether the Christian Greek NT documents contained the Tetragrammaton. Yes again this is true, but this forms no basis for arbitrarily inserting the divine name into other parts of the Christian NT Greek text wherein no extent manuscripts support such insertion. Evidence 4 – Early Jewish writings indicate that Jewish Christians used the divine name in their writings. Here the appeal is made to a third century Rabbinic Jewish document called The Tosefta. Herein Jewish writers are said to describe Christians cutting out the divine name from scripture and burning the divine name. I would urge great caution here. Firstly the quotes are from polemic Jewish sources and secondly no one is quite sure the references are about Christians. Christians viewed scripture as sacred text and it is extremely unlikely true believers would defame or destroy text in the way Jewish writers suggest. However the idea that Christians cut the divine name out of the scriptures suits the Watchtowers theory of an early Christian apostasy against the divine name. However the evidence here is extremely tenuous and should not to be accepted as definitive. Evidence 5 – Recognised Bible translators have used God’s name in the Christian Greek Scriptures. This is again true, although I would question the statement “recognised Bible translators” because each translation is the work of an individual rather than a committee. More importantly those translators whom have chosen to insert the Tetragrammaton into their English NT translations have based their decisions upon direct OT quotations or illusions. These insertions of the divine name are also extremely limited in number and as previously highlighted cannot find support in any extant Greek manuscripts. In other words it is the translators themselves that have decided to insert the Tetragrammaton NOT because of any manuscript evidence! The Emphatic Diaglott, by Benjamin Wilson (1864) – this is bias translation produced by a proponent of Unitarianism – a group who similarly denies Christ deity. The Epistles of Paul in Modern English, by George Barker Stevens (1898) Ironically this translation of Paul’s epistles is a liberal paraphrase omitting much of the literal meaning of the text. The book was produced in a simplistic style for Children and use in Sunday schools! The name Jehovah is inserted eleven times. St. Paul’s Epistle to the Romans, by W. G. Rutherford (1900). This translation inserts the name Jehovah only four times! Not a great deal to shout about here! Each insertion corresponds to an OT quotation. So what can we conclude? Firstly we note that some translations given in evidence are theologically bias secondly the majority of translations employ the Tetragrammaton in a very limited way in relation to direct OT quotes or illusions. Hence these so-called evidences are simply straw men erected to create the illusion that many translations insert the divine name multiple times, which of course they don’t! It should be noted that the name Jehovah has been inserted in the NWT (revised 2013) edition over 230 times and in may places the name Jehovah is NOT a direct OT quote or illusion but rather a arbitrary insertion based on theological bias. Evidence 6 – Some Bible scholars acknowledge that it seems likely that the divine name appeared in Hebrew Scripture quotations found in the Christian Greek Scriptures. Here the Watchtower draws upon the thesis of American Hebraist scholar George Howard. Howard set forth a theory that the original Greek NT documents may have contained the Tetragrammaton. However what the Watchtower fails to explain is that Howard’s textual basis for his study of the Tetragrammaton was pre-Christian. Howard only examines pre-Christian Hebrew and LXX manuscripts. It is upon these OT textual variants that Howard introduces ambiguity regarding the Tetragrammaton in the Christian Greek NT. Suffice to say Howard acknowledges his ideas are pure theory and cannot in any way be substantiated. The only thing we can be sure of is that the majority of LXX versions of the OT Hebrew substituted the Tetragrammaton for κγριος (Lord). It is therefore logical that early Christians employing the LXX would naturally copy over κγριος NOT the Tetragrammaton. Such evidence proves that there was no second century B.C. conspiracy to remove YHWH from all versions of the Septuagint and subsequently from the Greek New Testament. Why then has the NWT committee replaced the Greek word κγριος (Lord) with the late 11th century hybrid “Jehovah” The answer relates to the heresy of Arianism -the belief that Jesus is a creation rather than the creator. The Jehovah’s witnesses believe that God the Father alone is the creator and as such God the Father alone is uniquely called Jehovah. This translator bias to exalt the Father’s name as Jehovah obscures any connection between Jehovah and Jesus forcing the translators to inserts the name Jehovah arbitrarily into the Greek NT text. However it must be admitted that if the divine name occurs in the original Hebrew quotation why not insert it into the Greek NT? The answer is intellectual honesty! To be consistent with their claim to be “faithful to the original texts” the NWT committee should NOT under any circumstances insert the name Jehovah into the Greek NT text because they are fully aware that NO manuscript evidence exists to support such insertions. Therefore laying claim to the occurrences of the Tetragrammaton in Hebrew or LXX OT quotations is NOT valid reason to ignore the overwhelming manuscript evidence against such insertion. I would wholeheartedly agree. If the divine name was used throughout the Hebrew scriptures why was it not carried over into the Greek NT text? If (as the Watchtower suggests) the Tetragrammaton was part of the original Greek autographs then why has the Tetragrammaton disappeared from the Greek NT copies – such would seem inconsistent. How then can these so-called discrepancies be resolved? Did the Apostles incorporate the divine name in their writings and was there a later heresy removing the divine name as the Watchtower suggests? Firstly the writings of the early Church Fathers are entirely silent on any so-called “divine name” heresy. Various means of representing the divine name were used in the LXX (Greek Septuagint) copies including translations (κγριος), surrogates (κς, ιω), embedment (יהוה), visual duplicate forms (ΠΙΠΙ) and phonetic duplicates (ΙΑΩ). Interestingly Aquila in the second centruy A.D. produced a Greek translation of the OT Hebrew which contained palao-hebrew characters of the divine name. This was a translation produced for Jews to replace the LXX version. Likewise Origens Hexapla (3rd century) uses five forms of the divine name. The only conlusion that can be reached is that Greek translations of the LXX varied in their employemt of the Tetragrammaton depending on their audiences. However when it comes to the Greek NT (Christian Greek scriptures) and the 5,800.00 extant Greek manuscript copies NONE contain ANY variations of the divine name. Therefore although the early Church was aware of the divine name, and employed the name in LXX versions, no scribe ever inserted the Tetragrammaton into copies of the Greek NT text. The ONLY word chosen under inspiration of the Holy Spirit to translate the divine name was κγριος (Lord). We are faced with the inescapable conclusion that the Greek scripture writers, under inspiration, purposely allowed κγριος to have a broader meaning than the Watchtower admits. In certain places κγριος referred to the Tetragrammaton in other places it referred to Jesus. We therefore have before us a word viz. κγριος that refers to both Jehovah and Jesus. What does the NWT committee do with this evidence? In his earthly ministry Jesus himself claimed to be the “I AM” (YHWH) for which claim the Jews wanted to stone him (John 8:56-59). There is only one logical conclusion; Jesus is the incarnate Jehovah. Not that Jesus is the Father, but Jesus shares the same nature as the Father. Jesus is from the Father; he is the Son of God sharing in the divine being – very God of very God – “For in him the whole fullness of deity dwells bodily” Colossians 2:9. When it comes to inserting the name Jehovah into their revised NWT of the Greek scriptures, the NWT committee has NOT followed their own rules of translation. The Watchtower essentially traps itself in its own cunning for the paradox is this; if the NWT committee truly believed that the 5,800 extant Greek manuscripts contain the inspired words of God then surely they would not dare to insert the name Jehovah into their revised NWT? I submit to you that the NWT committee are frauds and hypocrites! Why? because they have chosen to ignore the evidence of the 5,800 extant Greek manuscripts and reject their own critical apparatus (Novum Testamentum Graece) which all omit the Tetragrammaton/Jehovah adopting instead κγριος/Lord. Just as the Pharisee’s of Jesus day “added” to the Word of God, the NWT committee has chosen to do the same. We might ask ourselves if God Almighty has not been able to preserve his divine name in the New Testament (as the Watchtower suggests) then how can we trust any part of the manuscript copies? The fact is honest and faithfull translators cannot add alien words to the ancient text which were never there in the first place! I submit to you the Watchtower pushes the name Jehovah in the NT because it has fallen into idol worship – The Watchtower worships a “name” rather than the God behind that name. 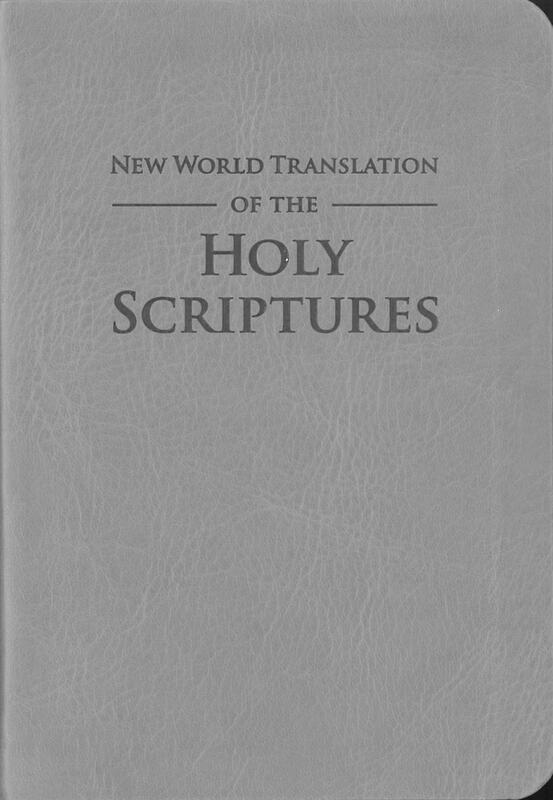 In conclusion, The Watchtowers “New World Translation of the Holy scriptures 2013 version” is a poor and intellectually dishonest translation. Its goal is to reinforce its own doctrines and obscure the true Jehovah of scripture, who is both Father, Son and Holy Spirit. Let us continue to expose the errors of the Watchtower and pray earnestly that the Father will continue to draw people to his Son by means of the Holy Spirit. Let us each play our role in the proclamation of the Gospel of Salvation defending the truth of scripture until our Lord Jesus returns. Comfort Philip W. Ph.D “Essential Guide to Bible Versions” Tyndale House Publications 2000. Tetragrammaton is from the Greek and means “four letters” this word reflects the Hebrew four letters יהוה which refer to the name of God in the Old Testament or Hebrew scriptures. The word in Latin is transliterated as YHWH. Pronunciation is difficult and scholars propose various options including Yahweh and Jehovah. LXX is a Roman numeral acronym for “Septuagint” a Latin word meaning seventy. The LXX is a 2-3rd century Greek translation of the OT Hebrew scriptures produced in Alexandria by a group of approximately seventy Jewish scholars. Various copies were made some containing a direct transliteration of the Tetragrammaton although the vast majority replaced YHWH with κγριος Lord. This document is not to be confused with the Greek NT Christian scriptures. Additionally because this is a translation from the Hebrew some would argue against its canonicity. Note that the LXX was used and quoted from by the Christian Greek NT writers. The name Jehovah is derived by combining the Latin letters JHVH with the vowels of Adonai (Hebrew for Lord). Two early examples showing the use of κγριος: John Rylands fragment P52, John 18.31-33; 37-38, date of composition circa 125 A.D. original autograph circa 96 AD. Manuscript P47 dated circa 300 A.D. is a fragment of Revelation 9:10-17:2 in which κγριος occurs four times but which the NWT committee without any textual evidence decided originally read “Jehovah”. This is very well written and explained, which is why I want to strengthen your argument by directing your attention to the difference between “illusion” and “allusion “. You use the former several times when you mean the latter. Not noticeable when reading aloud, but the difference is significant in text.